Society should strive to continue making the web’s wealth of information available to all individuals, despite any maladies they may endure. Many view ADA compliance as wheelchairs ramps, automatic doors, or raised toilet seats. When it comes to the web, however, accessibility unlocks a world of potential for a vast range of users including those with physical or mental conditions limiting their movements, senses, or activities. There is concern, though, that meeting accessibility mandates (such as AB 434 requiring all California state agency websites to comply with the Web Content Accessibility Guidelines or WCAG) may require a full website redesign. Fear not. The next generation of web development allowing you to expand and serve a more expansive group of customers and users can be achieved without the need of extensive resources – and without becoming apprehensive of accessibility stigmas. Yes, some programs assist with this particular handicap. But, many suffer from other physical and mental impairments restricting their use of standard computers. Arthritis, for instance, can become so painful that the simple “move-and-click” maneuver of a mouse is difficult. Multiple sclerosis can degrade the skills used for keyboard shortcuts to jump though web pages or applications that power-users enjoy. These maladies also require various software and hardware assistance to interact with sites. Accessibility is about providing a layer of standards that offer a more inclusive experience for all users. It’s about disseminating information in a form leveraged by software serving a wider range of consumers. 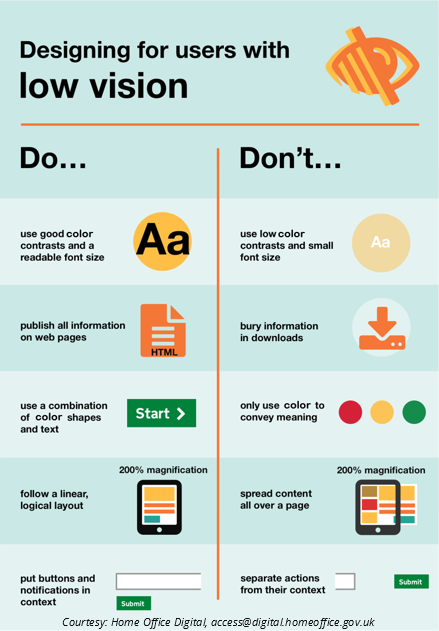 There are benefits to upgrading your site’s accessibility. When making your navigation more accessible, you may discover just how complex some of your site’s menus were designed. Despite your best user-testing efforts, navigation architecture that is not easily navigable via a keyboard is not a good visual experience for anyone, impaired or not. Implementing and testing your site’s navigation accessibility will offer a different, non-visual picture of the architecture you can use to better inform your navigation and interaction experiences that ultimately will benefit all visitors. In a practical sense, accessibility doesn’t have to be about adding invisible, random details folks without impairments won’t experience. Packed inside most accessibility mandates are useful, obvious features benefiting all users. One of the most common accessibility settings is “text size enlargement” on smartphones – an integral part of the WCAG requirements. Many of these smaller features add up to a user experience founded on implementing the best design trade-offs for most users while adding additional, accessible settings to include all users. In other words, embrace accessibility mandates as an opportunity to finally implement those obvious, no-brainer features that will benefit all users and further include the rest of your potential audience. A new category of devices and services are voice assistants. Siri, Google Voice, Alexa and others aim to deliver a “speech-only” version of the web. And the best way you can contribute to their availability is by making your site more accessible. Accessibility tags like “ARIA” and “role” are ways to invisibly indicate to voice services how a site should be read aloud, and can unlock future potential to these and subsequent innovations of the web. The goal: make all information of the web as accessible as possible. But don’t need to wait for others build the future. Here’s a practical way I use the accessibility features built into my phone – every day. 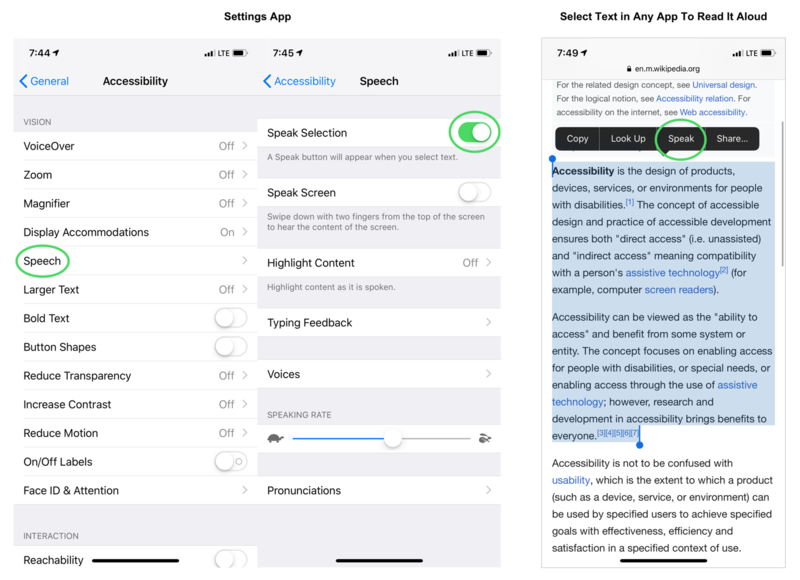 Enable “Speak Selection” This provides a “Speak” option when highlighting text in any app. Additional options include rate, voices with various international accents, and gestures to begin speaking everything on the screen quickly. When selecting text anywhere on your phone you now possess the option to have the material read aloud. This is great for turning any article or email into a mini audiobook. This is just one of many examples where accessibility can unlock purposeful experiences for your entire audience. Accessibility is the next layer of service that can offer immediate benefits for all your customers. By adopting accessibility guidelines (like the CWAG principles mandated for California state agencies) your web information can become more accessible to humans, machines, as well as the next generation of services – unlocking a world of options. Accessibility should include all people, and provide an experience benefiting everyone. Author: Sam Dominguez, Interaction Designer, Trinity Technology Group, Inc.